ed Levels and Trends in Child Mortality 2014 report, the United Nations Children’s Fund (UNICEF) and partners announced that since 1990, nearly 100 million children’s lives have been saved – including 24 million newborns. Yet in that same time period, a staggering 223 million children have died before their fifth birthday, mostly from preventable causes. In 2013, 6.3 million children around the world have died before the age of five. That’s 10 times the population of Washington, DC, or 17,000 children dying every day. The under-5 mortality rate has been reduced by nearly 50 percent since 1990, yet important challenges still remain. 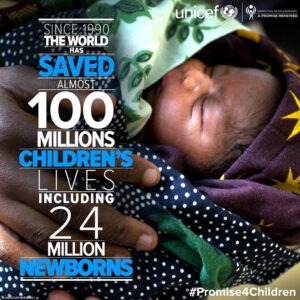 In the annual A Promise Renewed (APR) report, which was released alongside the Child Mortality report, UNICEF addresses these challenges and the work that remains. We know what it takes to end preventable child deaths. This year’s APR report focuses on the importance of newborns, equity and quality of care.